There are a few traps that can catch you out, even after you've created the content for your book. The biggest one - endless editing. After years of experience, we know the biggest challenge people face is letting go and getting their book out their, in front of people. The temptation to edit, and tweak, and edit some more can be overwhelming. Months can pass and you still don't have anything to share. The good news is, you don't need to do that! If your book is being used identify new customers, if you're giving it away as a way to start a conversation, then 90% and out, is much better than waiting to get to 100% (which, by the way is an illusion), and sat on the shelf. Remember, your book is not the product, and in today's show we talk about some of the common editing traps people fall into, and how to recognize them. One of the issues is keeping your 'beneficial constraints' in mind, so we wrap up by talking about the right time to create a second book. This is a great show to keep you moving toward the end of the process. Stuart: Hey everyone. Welcome to another Book More Show. It's Stuart here with Betsy. Betsy Vaughn, how are you doing? Betsey: I'm fantastic. Happy day, Friday. Happy day. Stuart: Every day is a happy day. Stuart: Just a little more happy than others. Stuart: ... good to be here. Very good. Kind of getting acclimatized to the warmer climate in Philadelphia. And, getting into some schedule up here. So, it's nice to slowly be getting into a new routine. And hopefully, a better routine of you and I recording and then after Dean's summer tour, getting into more of a routine with getting Dean on the show as well. Because I was looking back through the last few calls, and we've got a number of More Cheese Less Whiskers episodes that we talk about books on. So, I'll sometimes refer back to those in the stream. Stuart: ... special appearance. I know. It goes fast, right? Betsey: Yeah, it does. All right, Mr. Jackson needs to make an appearance. Stuart: The other thing I might try and do as well is ... Although I'm thinking about it out loud now, so I'm not sure the best way, but get a better ... On the More Cheese Less Whiskers Podcast, I'd like to see if I can categorize those where the conversation is more specifically around books, or tag them at least as 90-Minute Book related episodes. And that way, people, as they're listening to this now, can always jump across the More Cheese Less Whiskers Feed and filter it by the 90-Minute Book tag. And then that will get access straight into those recordings as well, because I know not everyone's subscribed to each of the individual feeds. So, I'll try and remember to do that after we get off the show and I'll tell everyone the update next week. Betsey: Thank God. Good idea. Stuart: Well, today, you might be able to hear that my voice is a little croaky again, so hopefully we're going to get through it all before it gives out, but today we're going to try and hit two things. First one, again, this is like last week's, this is because a subject's come up or the last week or so as we've been talking to people, so we want to talk about editing and how much is enough. So, again, we'll specifically be talking about the 90-Minute book process, but the same applies to whether you're doing this yourself or whether you've got someone externally working with you to do this, but we'll talk about it in the context of the 90-Minute book process. And then the second, assuming we've got time, is running to segmentation and creating a series of books, and how best to break out rather than ... Again, this comes up quite a few times in conversations with people that want to include a broader mindset or information and quite often we'll say to people think about what the job or work is, write enough to support that case and then keep the rest of the material for a second funnel or a second book, because that's more effective having three books that'll tell you loads is more effective usually than having one book that is just on a broader subject. So I think we should have time to hit both of those, and hopefully I'll definitely answer the question for knowing the people that we were talking to over the last week or so, but as you're listening to this, the editing one particular, I think for most people, that definitely is something they run up against. Betsey: Yeah. We hear this. I work closely with production, Kim in production and so constantly people will get their book, and we had this conversation this week just about how people, they think what they've put out there and what they've sounds one way and they actually see it in print, maybe it's not exactly they thought it would in their head, it didn't come out of their mouth that way, and so sometimes they start getting into it, and I think they just start peck, peck, peck, peck, peck, but this is something that we do almost every single day in our business. It's nice when you get the occasional person who says, "Now the book is absolutely, exactly perfect. It's what I want, what I need." But more so critical of ourselves that that doesn't happen, where it's more a lot of editing going into it and spending a lot of time ... I hate to use the word nitpicking, but it almost gets down to that. Stuart: And I think the real issue is opportunity cost. So it's not so much that with infinite budget and infinite time, it's not so much that it's a bad thing to do, but is the opportunity cost, what better, if anything, could you be doing with the same energy and budget and attention. So let's describe briefly what happens, the tsunami and when she comes out most of the times. So, as everyone knows, the most effective way of creating the content is recording it. It's difficult to record it yourself, because it's difficult talking into dead mic. The easiest way is to have someone interview you and have the structure already defined so they're on a single recording from start to finish. You work your way through the content and end up with something that encapsulates and captures all of your best ideas, your best thinking on this subject. So what you end up with, then, is copy that is transcribed from the call, and when you receive that back, even after a number of rounds of editing, preferably by someone else, not you, because otherwise you really sink into this trap sooner rather than later. It's actually pretty difficult. It's like marking your own homework. It's actually pretty difficult editing your own content immediately, because that first pass that comes straight from a call recording is always not rough in terms of the content but rough on the eyes a little bit because it has all of the breaks in the speech, all of the part-finished sentences and where you jump around a little bit, just seeing that raw copy, it's difficult to edit it yourself, because you're too vested, you're too close, you've got all the assumptions like you were just saying people typically think they sound or talk differently to how they actually talk, because all of the foibles in speech, artifacts of talking versus writing, anyway, so all these things, it's very difficult. Betsey: Absolutely, yeah. I think that's key, because I think we had a situation earlier on this week where someone felt that it was too much of a task for them to take on. This is someone who's in medical, dental field, so I think it's not their comfort level and so they were looking at it as a 60-page book and very overwhelmed by the whole process. And so my advice was, "Okay, well, how about we find somebody else do it, like in the office, someone who has the same knowledge that the doctor has, but that can at least go through the first round, or if he is willing to do one chapter at a time, one chapter may not seem so daunting. Stuart: And I think the issue is, or one of the issues at least, is that typically people are thinking of things in the traditional publishing sense. They're just naturally coming to it from the mindset that this is months' worth of work and it's difficult and hard, and no matter how much you try and tell people it doesn't have to be that way, they have assumptions, their mindset, that's where they're coming from. So that's what they're baselining against. This is why so much with the process as you're working with us, we try to take all of that away from you. So that it's all in the background and the thing that you're presented with is the thing that is absolutely good enough to go straight out while there may be things that you want to add or change or take away potentially, but as we'll get into in this conversation, the advice is always it's way, way, way more effective to get this one out there and move your attention on to the next one and then the next one and the next one, which is why we also want to talk about serialization today, than it is to get bogged down in the details, because at the end of the day the book is not the product. You're not making money from the book directly; this isn't about book sales, this isn't about winning some literary award for the best piece of writing. This is all about creating something that is compelling and takes people to the next step. The content has to give value to start the relationship on the right foot, but it's not supposed to win any awards. You're not even necessarily trying to write enough to change people's minds. This isn't a huge manifesto ... I was trying to give an example but all I can think about is bad examples for manifesto books. This isn't supposed to be a War and Peace or a magnum opus on every detail. It's moving them forward. And then if there's a second book in a second funnel talking about a second element of your business, again going from zero to 90% is much, much more effective than going from 90% to 95%. Betsey: Right. And that's sort of my constant. I mean I really could just record this and push the play button over and over again. This isn't the conversation that I have several times a week. My thing is make sure the content is accurate, particularly if you're in one of those fields that can get you into trouble, medical, legal or financial or something ... Obviously you want to make sure that information is as accurate as possible. And that's always what I say to people: just make sure it's accurate. Don't worry about if the comma's in the right place. We can debate styles back and forth all day long. We can decide does it need to be a comma? Stuart: Exactly. I was just going to say the same thing. That's the other thing as well. Styles to a certain degree, there's some things that are black and white, correct or incorrect, but the 80% of it is by far a stylistic preference, which you as the author, you could have an opinion, someone else is the editor is going to have an opinion, every reader is going to have an opinion ... So that's a definitely want to avoid and bog down into. Betsey: Bogged down with it. That's the thing, make sure the content is correct, it's an accurate and factual, so it doesn't get you into trouble, and then get the book out there and start using it. That's hard for people to ... "But my name's on it. I want it to be just perfect and I want to make sure all the information's there." I hear that a lot, too. No, you don't, and you just said that a minute ago. No, you don't. Everything doesn't need to be in that book. Stuart: Yeah, it's all irrelevant. Yeah, it's irrelevant information. And this is why we say go deep in answering one narrow subject rather than trying to go to broad, because going broad means that you'll never have all of the information. At least going deep on the one subject means that you can get to the point of it being comprehensive enough to answer the question that's raised by the title. And it's definitely not that we're saying keep stuff back or intentionally keep stuff out, it's just that you could be here two years later and still not have it out of the door, still trying to include one thing and another thing and another thing. That doesn't help the customer. As long as you're going into this with a genuine intent, you know the very best thing ... Like, for others, we know that their absolute very best thing is that someone doesn't get on the 5th phone call and ask us a whole lot of questions, just jump on board with the product, get something recorded and get something out the door. We genuinely believe that that's the very best thing that they can do. All right, before we started recording I was talking to Betsy and promised not to go off on a rant, pick the single target market and then stay focused on that, but it's difficult to avoid. Stuart: I want us to jump back slightly to describe the problem a little bit more so that people can recognize it, because sometimes it's difficult for you to recognize when it's happening. So, from the transcript, you've got a document back that's gone through with the first pass of editing. Now, in theory, that should be good enough. Certainly internally for the books that we create, anyone that knows Dean or has worked with Dean before or been around him before, knows that he's very much almost at the other extreme of just get it out and move on, get it out and move on, because he does have a skill of being able to talk about something coherently and consistently so that the first pass, apart from just some grammatical tweaks and edits from the recording, is good enough to go out the door. But I think people would be surprised when they know how little editing was done on the 90-Minute book and the Breakthrough DNA and Listing Agent Lifestyle, all of the ones that we do internally, very, very, very light to the extent that Dean never ever sees it and we only really send it out to one external edit, do away with mistakes and all of them. Point being it doesn't matter because the message still is out there. So, this first draft that you get back, the first version that you get back, so, if you're working with us, we'll have sent it through a couple of revisions so the heavy lifting on the grammatical changes and tweaking some of the language that just comes across in conversation, like removing the "yeahs" or the "likes" which I just did, removing the word "that" to a certain degree, because "that" in a conversation, it makes sense that you're referring to that, but when it's written in the book, it stands or a little bit. Anyway, all of this heavy lifting stuff that we do, the version that you get back should be good enough to go straight out of the door. So what you're really looking at doing then is exactly what you described a moment ago, and as I said, if you're not working with us, get someone else to do this first pass so that the thing that you get back should be good enough to go out of the door. Particularly, again, another benefit of working with an organization, I have done 500 times, is the outline. We put a lot of time and attention into making sure that the outline is comprehensive, and when the call is recorded, all of those outlined elements are captured, because if you're just recording something and trying to wing or working off an outline that you haven't really given much time or attention to, then you are going to record stuff in there's going to be things missing and you're going to be less satisfied with it. This really is the last thing you should be thinking or doing, is fixing it in post. You should always be trying to make sure that those things are covered up front. So, all of that being said, the thing you get back, then, is a document that should be good enough to go out of the door. Concentrating on making sure that there are no inaccuracies factually and the content is fair, just as you said before, is the number one most important thing. But everything above that, grammatical options, whether or not certain elements are included or excluded, the flow of it, all of that should have been considered before you even started recording. And as long as that outline is done, then really the amount of editing that you should do afterwards should be very, very limited, because as we started off by saying, the risk is the opportunity cost. It's not that it's problematic to do, it's not that it causes more problems, it's not even that it's a bad thing to do, it's that you will spend weeks, if not months, if not years, with this thing not out there engaging new potential customers and helping people. It will see on the shelf and not move you forward. And even internally we see that, internally with people saying, "Oh, yeah, I just want to do a quick pass through it," and then years later and so and so confronts us, we've never heard back. And it's a shame, because that great information isn't getting in the hands of the people that really need it. Betsey: And when you stop and think about it, most of our clients are just one right person, one right client would have paid for the book. And that's the thing people don't get. That's been sitting there and you've done nothing with it, and it just would've taken one person who's not your grammar or your spelling or your other thing. Betsey: Exactly, growing those leads and using the book as it's intended to be used. Stuart: Yeah, to start that conversation. Betsey: I think about, because we did have ... I thought it was kind of funny that someone took the time to go through one of our books and send it over back to us with all ... And again, a lot of it was just style preference is what it came down to and so I made the executive decision what got changed and what didn't. I just laugh at that, but I don't think like that, because I read just like I speak, and our audience hears it, I'm all over the place, I stumble on my words, I say random things, I make up words sometimes because I speak fast and that's how I read. So I can't imagine someone reading a book, even a 25-page book and catching all of that. When you see something like that and someone like ... You can't enjoy. If I was that person, I would never be able to enjoy anything I ever read. So people are not reading books to find your errors. They just want to see what kind of great content you're out there providing and get some great information. Stuart: Exactly. I mean, we've done whole shows about the fact that, realistically, the amount of the words on the page that actually read is astronomically smaller than people anticipate. That's just another reason why the prospect or the thought that people are wasting six months, three months, even three days procrastinating or worrying over making sure that things are perfect, is really just such a false economy. It's just crazy. Betsey: People are listening and really taking note of these words, because like I said, we've talked about this a lot. I have a lot of conversations with our clients, current clients, potential clients, about this, and I really hope they will take this to heart, like, "Okay, I really don't need ..." Even if you're doing it yourself, just know it does not have to be that perfect document. Stuart: Exactly, and we've seen this time and time again, and this is the reason why we get a little bit heated and passionate about it, because it's not that we're trying to justify our own actions or give people excuses. It's that we know time and time and time again, that the most important thing, not even for you, forget about you as the person thinking about writing it, think about all of the customers. If you genuinely believe that people are better served working with you than not working with you, that it will make their lives better, that it will fix a very important problem. I was going to curse, there. But for the sake of the iTunes rating I won't. Get the damn thing out there in front of people where it's going to help. Two things and then we'll move on to the next bit, because it's easy to start just ranting about it. Hopefully people have got the message there, but the two things that spring to mind are ... The first one, I've forgotten, but the second one was that point that you were saying that the value of getting it out there, even if there were things that could be corrected, is for most people listening, a small handful of clients can make all of the difference and pay for any budget of the book and really start that lead generation. So we were talking, just before we started recording, about someone else that you'd been speaking to about the book, they'd been introduced to us by an old podcast from someone else's network, and they were talking about, "Hey, well, last week I just sent out a nine-word email," which is something that we talk about, a short personal expecting reply type email, some of them we talk in some of the other frameworks. And they, from that activity, have got two clients worth seven grand. Stuart: Oh, seven grand each? I didn't realize it was that. Stuart: Just from sending out the nine-word email. And that correlation to having a book which is shares fantastic information but isn't looking at winning book awards, but does engage with the type of customers that you're looking at why would you not want that out tomorrow, as quick as possible? The first point that I was going to raise was on a similar vein, and this is the amount of overhead and the costs associated with it, so I talked about the real issue being the opportunity, but just in terms of the raw cost, we tell people coming to us who have spent five to 15 grand on trying to get a book out there, and they've just burned through money paying people to do revision after revision after revision, still not ended up with something, if you want to do that, well, if you want to do that, feel free, but actually if you don't want to do that, call me directly, give me the 15 grand, we'll go back through our normal process between 1800 and 2800 and then everyone will be happy, and you and I will have a summer retreat somewhere. But, joking aside, money can absolutely start evaporating and as soon as you start paying the hourly people to go through and tweak and tweak and tweak, because it is an endless pool. Go back, read something read a blog post or something from two years ago that you were absolutely delighted with at the time, and I bet you would now find things that you would change, not because the market's changed or because some knowledge has changed, just because every single time you look at something you could make a tweak. And without the constraints, we talk about this in the Book Blueprint School Card, about having beneficial constraints. Without the constraints, you're never going to move on this and you're just going to burn money. With that being said, do you know when we started recording I was thinking, 'Yeah, we've got two things that we want to talk about, but maybe this will be a bit of a short show,' but we're already 25 in and we just hit that first point. So we've talked about where to draw the line on the editing, so make sure is factually correct, grammatical differences, if you do have a particular pet peeve, you could make some changes, but just be very careful because it's a bit of an endless pit. And then adding things or wanting to include bits and pieces, compare it back to the original scope, so you've got a title at the beginning and a call to action at the end, and every word in the middle should move people from cover to cover. It should move people from, "Yes, I've got this question or problem articulated in the title," to, "Oh, I see now that this is the very best next step," the call to action at the back of the book. Every piece of content in the center should support that goal of moving someone from the beginning to the end. All the additional stuff then, or all the ancillary stuff, that Venn diagram that you're drawing and all of these different chapters and possible things to include, the ones that don't cross over or don't cross over enough, they are candidates for the second funnel, a second sales channel, a second way of engaging people. So the easy example that we talk about sometimes are things like if you were a chocolate cake lover and you were walking through the supermarket and you saw the overhead sign, the advertising things at one end of the store, there was something saying, "Cake," and at the other in the store there's something saying, "Chocolate cake," you would walk directly to the chocolate cake because, although you're a cake lover, you're really a chocolate cake lover, and that particular section of the shelves has enough content in there to give you exactly what you want. The same with the books. Including, then, stuff in your chocolate cake book about ... I must be hungry today, about your chocolate cake book about strawberry cake or donuts or bagels or as we're getting further and further away from actual cakes, then all of that is potentially a second channel. And if you can serve people, not only chocolate cake lovers, but strawberry cake lovers and bagel lovers as well, then write in the book that talks about the answer to the best chocolate cake, the answer to the best strawberry cake, the answer to the best bagel ... Having those as separate books is far more beneficial when you think about overall marketing campaigns than trying to shove all of the bagel stuff and all of the strawberry cake stuff into a generic book about cakes, or worse still a book that was originally about chocolate cakes, but now you're trying to shove in all of this other stuff. Does analogy stand up? Did I make sense? Betsey: Yeah. Absolutely it does. I was just thinking of different books, possibly, that we could do, other subject matters besides cakes while you were talking. Stuart: So the florist one is one example, so we keep coming back to this, so sticking with that for a second, we used examples previously of wedding fliers in Maine, I think it was the example that we were giving. So, if you were a florist based in Maine, having one book that talked about wedding flowers and another book that talked about funeral flowers and another book that talked about how to enhance the value of your office by having fresh cut flowers in there, another book about flower arranging if you also run a flower arranging class ... All of those things are relatively standalone, because although there's a crossover, they're all talking about flowers, the drivers for someone looking for wedding flowers is very different than the drivers for someone looking to increase the environment in which they work, do something about the office. We always talk about dentists before with the sample that we were talking about, the editing, so that particular dental procedures are also pretty different, depending on what you going in for. Someone looking to ... I'm trying to think of an example. But someone looking for a pain free solution to root canal surgery or overcoming fear of going to the dentist, just for general routine work, is very different from someone looking for teeth whitening or teeth training, Invisalign, all of that type of stuff. Even down to the day-to-day dental routine work, you might be thinking that's a difficult sell, because clearly there's a marketing drive or there's a desire for straight teeth, white teeth, Invisalign, teeth whitening all of that kind of thing, the cosmetic side of things. There's quite a lot of passion associated with that, but there isn't a lot of passion associated with the day-to-day dental work, and you could argue that one dentist to another doesn't really make that much difference, there's not that much that differentiates them. And, again, this is potentially talking as an outsider, there might be a lot of a differentiator. Betsey: But I think that's pretty much any ... You look at the clients we have, I was talking to this real estate guy today, and he's like, "Well, yeah, I'm in real estate," which is just funny, because I hear this a lot. "Oh, I'm in real estate. And now I want to write a book." It almost scares me sometimes, because that's the blanket statement. Okay, well, do you have a focused market? Do you have a targeted market? Do you specialize in condos in Miami Beach, or are waterfront property in Jacksonville? Is there something that you ... Do you really want to write that great big book about real estate? Because most people don't want to read that great big book, that great big thick book on real estate, so, let's take it and those few things that you do really well or you're focused on, and let's turn 'em into a few different books. Stuart: And for people to long to read it. Betsey: Yes, want to read it, because that's ... And I said that with this real estate gentleman today that I was speaking to. He's like, "Well, you know, I'd like to talk just a general getting started in real estate kind of thing.' Okay, that's fantastic. That's simple, that's easy. "But also, my specialty is foreclosures and capital investment." Okay, great, but there you got another book. Buying and selling foreclosed properties and raising capital and another book, so we kind of went through. He was a little more focused more one of our followers, if you will, really into Dean and knowing what's going on, so he was a little more focused, dialed in a little bit better, but there was so many, when you get those calls and someone's a dentist, I like when someone really gets ... Sorry, I'm hanging over noise. Sorry about that. Stuart: The voices in your head again. Picking up on those individual areas, I think is great, because it's actually as you said, it makes it more beneficial and helpful when you're thinking of writing it, because it gives you scope. So, as you're listening to this, if you want to go deeper into that particular thought, then jump back to one of the earlier episodes of the Book Blueprint School Card where we talk about the mindset of choosing the single target markets, and that will help you dial in a little bit more. I want to talk briefly, because we're running up towards 40 minutes, so I wanted to talk briefly about the different types of serialization or the segmentation of how you can do it. We talked a lot about segmenting by market group and marketing funnel of how you might want to attract those people, but there's also the opportunity to segment on a linear journey of how people are moving through the process, kind of like the 101 of the book and the 202 level of the book and the advanced level of the book, so moving forward in terms of depth of understanding. So introducing the subject at the top level is great for people who don't have awareness if you're trying to introduce a new subject but go in deep on a particular area or going into more technical ... having more assumed knowledge, basically, when you start writing, is that next level down or maybe even two or three levels. And depending on your own use case on how you want to use the book, then serializing in that way might be beneficial as well. So, with the real estate investing, there's going to be a book that's the introduction to the subject, assuming that people have got no prior knowledge, really introducing some terms and some concepts in the high level of what we're thinking about, him but there's also some very technical levels to it, whether it's source of funding or the structure and organizations or how to put deals together, that level of depth to it and segmenting the books by competency, if you like, for want of a better term, then that's also an option. We don't talk about that very much, because we're typically dealing with people who are looking at top of the funnel stuff so introducing the subject, but I think is worth mentioning because it is relevant for certain people. But the only thing I'd suggest that people think about it in terms of, is as we've said with everything else, start with the job of work, start thinking about how are you going to use this book or why you even need a book in the first place, and if you're not selling an advanced course, if you're not looking to attract people who are advanced members of the community, then it's not necessarily useful to start including all of that in a book or writing a separate book on that subject at all, because you're just adding volume or you're adding more words, but not words that necessarily move the needle forward for that particular funnel. That's a separation that, again, going back to that job of work and thinking about whether you need the separation at all in terms of what it's going to do, is going to save you a lot of headache, because I think, again, it's very easy to get, like with the editing, it's very sucked into this mindset of I need to do all of this additional stuff, where actually, have you found the purpose of it. Betsey: Yeah. That's great advice. Stuart: I think, though, the other thing on the segmentation thing that sometimes comes up is just the overall breadth ... I'm trying to think of an example to back it up, but maybe like in the florist example, and if there are elements of the business that you don't get involved in, or maybe like ... What's the American term for IFA, the financial guys? CPA or financial advisor, those types of guys, that whole tax environment or business setup environment, I mean, I would imagine that if you start getting into the code, there is a million things that you could include if you want to comprehensively include everything. That's usually not necessarily worthwhile. Then the other thing that sometimes comes up when we're talking about ... It's a little bit more what should be included in the book rather than the serialization, because sometimes people will get carried away with the serialization and think, 'I should include this and this and this and this and this,' whereas actually, it's not worth it. You might have one person every five years that asks about this particular random subject, and unless you wanted to really specialize on it ... I guess what I'm saying is just because you could do it, just because you could include it or you could serialize around it and create a whole separate book, doesn't necessarily mean that you should. Again, same premise, I guess, just go back to the use case and what you're actually going to use it for and what's the value. Betsey: Right. I agree. That's good. Stuart: Yeah, it's less is more, often, I think. Betsey: I agree with that. I think that that's something that's one of those things when someone first contacts us, they just really, I think, sometimes can feel overwhelmed with they have all these ideas, and so one of the things we will guide you through and help you with is narrowing it down and pulling some of the most important subjects, the things we need to focus on when you're writing that book, that we don't have to put all of that stuff, if you will in there for lack of a better term, stuff. Stuart: Yeah, exactly, it is just more stuff isn't it, it's filler and padding if it's not supporting the goal. Betsey: Right, exactly. So put in what people want to read it, the information people want to read, what's going to be must beneficial to your business, those are the things I need to focus on versus 250 pages of words that people are not going to read. Yeah. Yeah. Stuart: So, with that in mind, let's wrap it up a little bit and give people a couple things to point towards. 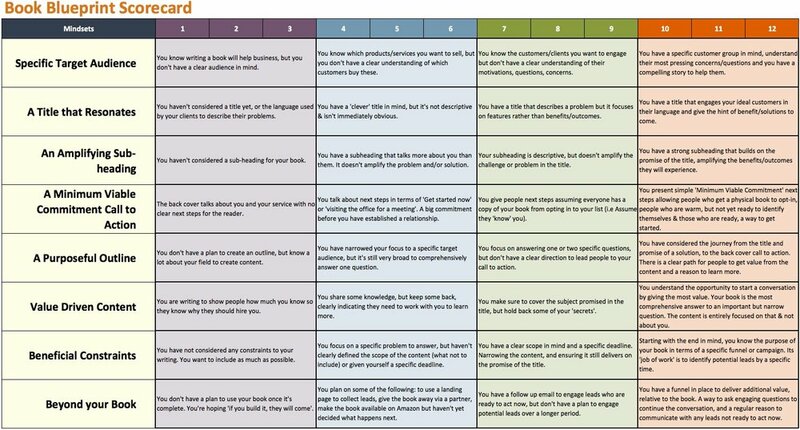 So, the first one as you listening to this, if you haven't yet, head over to bookblueprintschool.com and fill out your own book blueprint school card, so across the eight mindsets that we've talked about in the past and continue to talk about, the eight mindsets of a great book, it will help you assess at what level you are in each and it will give you some pointers as to where you might want to put the focus. So that's the first thing, bookblueprintschool.com. If you want to be a guest, we're getting some guest spots slotted in over the coming weeks, so if you want to be a guest, and we can talk specifically about your book, whether or not you're a customer, we can talk about your book and the book ideas and its research and all the types of things we talked about on the show, so head over to 90minutebooks.com/guest and fill out some details and we're going to get some guest slots scheduled over the next couple of weeks. Great opportunity to brainstorm some ideas. And then, last but not least, as you've already heard us say, we passionately believe that the best thing you can do to get your book out there is to jump on board and do it with us, and we can guide you through all of this, so head over to 90minutebooks.com/getstarted or the Get Started button's on the top of the page, and then there you'll have the opportunity to get started just like the button says. Stuart: It is that easy. Yeah, yeah. So, another great show, thanks for your time, Betsy, I will get this up in next day or so, and speak to everyone in the next one.